The inherent contradictions in that decision are inescapable. Italy is a country that has experienced a ruthless foreign occupation and was ravaged by fascism and war. To be a party in Israel’s constant attempts at whitewashing or, in this case, “sport-washing’ its military occupation and daily violence against the Palestinian people is appalling. Every attempt aimed at dissuading the race organizers from being part of Israel’s political propaganda has failed. The millions of dollars paid to the Giro d’Italia organizers, the RCS Sport, seemed far more compelling than shared cultural experiences, solidarity, human rights and international law. 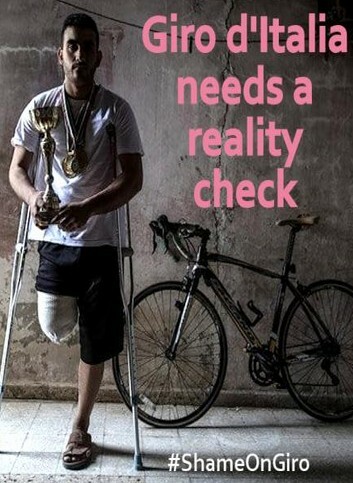 Palestinians, like Alaa, whose cycling career is over, are, of course, excluded from that lofty, and selective definition. Was the 12 million dollars received by the organizers from Israel and its supporters a worthy price to ignore the suffering of Palestinians and to help normalize Israeli crimes against the Palestinian people? • Romana Rubeo, an Italian writer, contributed to this article.